After months and MONTHS of work on our bathroom I am finally able to announce that we are close enough to finished to unveil some of our hard work in the form of photos. See that wood floor? I did not put that in. 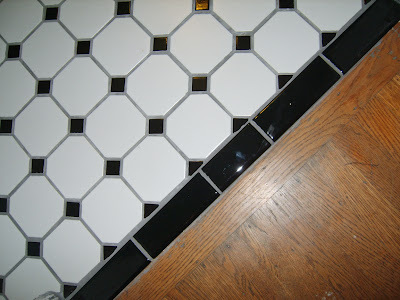 See that tile floor with the black tile transition strip and all that pearl gray grout? I did put that in. All by myself. Mr. Kaos watched me and handed me the occasional tile… okay, he helped a little more than that by cutting a few tiles for me too. I’m super happy with how it turned out. But you didn’t want to see that floor. I mean jeez… what is there to a floor? Only several days of hard work sanding, leveling and thin setting then tiling and finally grouting and cleaning. Lets move on to the sink. We bought it at the store. It is a sink. You know a sink. Originally though we had chosen a gorgeous wooden base that would have brought a lot of warmth and a little storage to the room, but we realized there would be nowhere to put knees as one sat on the toilet so we had to use the pedestal instead. Aren’t the fixtures lovely though? Mr. Kaos did a bang up job installing this all by himself. I helped a bit with getting the taps hooked up but I was probably a little in the way, I just wanted to be part of the process. The Shower. Did you guys see what the shower used to look like? No, no you didn’t… I never posted a picture because it was just too…. well it was pink. And generally I like pink. I have a pink bicycle. But these tiles were pink mottled square tiles that were kind of crooked and very ugly. Though I haven’t had the chance to grout it yet I thought I would let you all take a peek at my sleek white subway tile and black cap. It’s the same black tile I used to transition to the hardwood floor in the hallway. Soon the shower will have the same pearl gray grout as the floor and there won’t be a screen sitting in it (that will go back in the window. Really!). 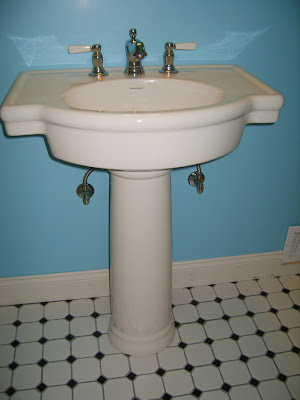 Then after the holidays we’ll have the tub re finishers come out to make our comfy old tub look like new. But like I said, the tile isn’t done yet because it still needs grout, and I am not showing you the window which needs another set of trim and some paint, and the baseboards need a coat of paint too. And I haven’t put in the art or the toilet paper holder or the towel wrack or any of that. For a bathroom that’s finished there’s still a lot of work to do. Isn’t it beautiful? Let me tell you about it, it’s a TOILET, and it flushes. Not only does it flush but it flushes the first time you try to flush it and then… you won’t believe this but after you flush it you can just close the lid, wash your hands and walk out. you don’t have to jiggle the handle or open up the tank to fix a chain or pray to the toilet gods and make a virgin sacrifice or anything. It just does its job. 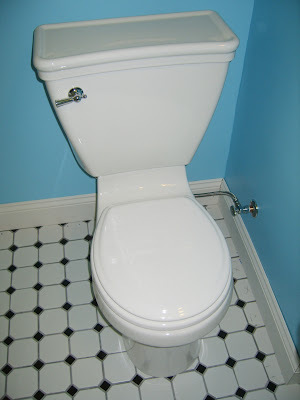 Did you know they made toilets like this???? It’s a thing of beauty and it is done. Finished. Complete. The pictures don’t load for me. I’m beginning to suspect you haven’t even had anything done.You’re like one of those attention seekers who pretend on their blog they have died or got a terminal illness. But with bathrooms instead. What Dan said. I see the last picture of the toilet, but the others leave me with the impression that your bathroom looks like little red X’s. But that is a kickin’ toilet. That’s awesome! GREAT job on the tile. Lori: Thank youHolmes, Dan: Maybe my bathroom only appears so people who believe in it…seriously though, I see all the pics… but I will see what I can do to make the pictures appear.CR: Thank you! That is one beautiful porcelain goddess, right there. You go, girl. That’s a lovely toilet.Well done sweetie.And all this and doing Bert too.My house looks like a sty, yours looks like a palace.Jealous, moi? Oh holy crapmoly… I can’t believe this. I posted a comment right after Lori’s, that I couldn’t see the pics either. So I came back to see if I can see them at home, and NOOOO, and wherethemfdidmy comment go??? I even saw it POSTED at work! I swear! I think it went to use that bathroom I can’t see either. Looks great! It’s a nice feeling to be so close to done. I spent the weekend sanding the last wall on my project. Painting and floor this weekend! Ooh! I’m sooo jealous!! My bathroom is DISGUSTING. 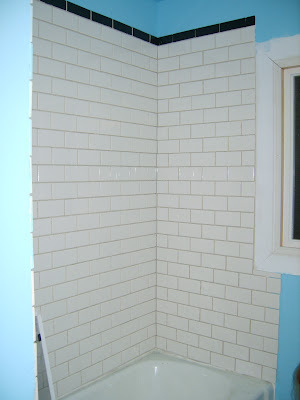 I love the blue and the white subway tiles. I’m trying to convince OH that we NEED white subway tiles. Cami it is FABULOUS! the colors, the tile the floor! Really well done, mate! You know how I loves me some subway tiles!It is lovely and you guys have done a lovely, lovely job!The light is my favorite, I have to admit. It rocks.Your blue don’t look nothin’ like our blue!But it is awesome. All of it!Oh and I could not see the pictures until I clicked on one of the x’s and then they all magically appeared.Wait – now I see that all the pics are x’s on your sidebar.WTF?! I am in love with your sink! We make a great team babe! (but you already thought that before we got married)You do the stuff that I won’t do, and I’ll do the rest. It works out well. We both have laughed about how a remodeling project can ruin a marriage- not for the two of us!I am also really proud and thankful of your “mad skills”. The quality of work shows it.Nice work Cami. You deserve to be proud! That is awesome, great work and maybe you should come fix one of our toilets, bloody thing has to be jiggled all the time. It looks beautiful! 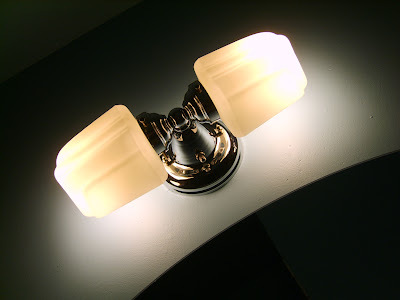 I love the black and white, and the lighting fixture is gorgeous! My entire downstairs and the stairway is done in hideous tile and needs to be redone. You can stay here and loaf on the beach…as soon as it is 100%.completely.finished. When are you coming to California?